Theatre Company of Saugus is happy to announce our holiday season show Nuncrackers, the Nunsense Christmas musical. With book, music, and lyrics by Dan Goggin, about a group of nuns who love to entertain, the Little Sisters of Hoboken. They are taping their first TV special in the cable access studio built by Reverend Mother in the convent basement. It stars the nuns you love, plus Father Virgil, and eight of Mount Saint Helen’s most talented students. Featuring all new songs including “Twelve Days Prior to Christmas”, “Santa Ain’t Comin’ to Our House”, “We Three Kings of Orient Are Us”, and “It’s Better to Give than to Receive”, this show is filled with typical Nunsense humor, some of your favorite carols, and a fruitcake cooking demonstration by Sister Julia, Child of God. This Nunsense Christmas Show will make you laugh, and maybe tug at your heartstrings. It’s the perfect way to insure that your holiday season is merry and bright! 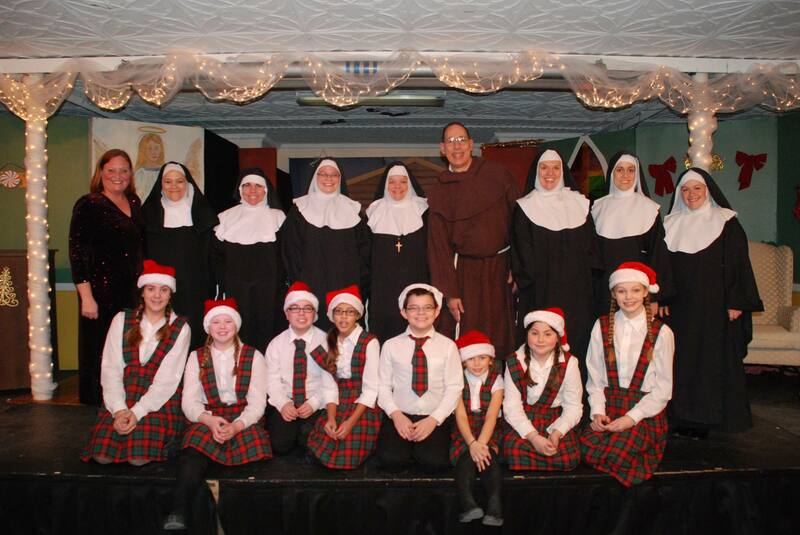 Performances of Nuncrackers are December 5-6-7 and 12-13-14, 2014. Fridays and Saturdays at 8:00 PM, with Sunday matinees at 2:00 PM. The location is the East Saugus United Methodist Church, at 85 Chestnut Street / Saugus, Massachusetts 01906. See our Directions page. Tickets will be on sale in November, and will be $20 for adults, or $17 for seniors, students, and children. If you purchase tickets by December 1, they are only $15 each. There will also be some other ways to get discount price tickets. See our Tickets page. We are proud to announce the amazing cast of Nuncrackers. Many thanks to all the talented people who auditioned. Nuncrackers. Book, Music and Lyrics by Dan Goggin. Produced by arrangement with Tams-Witmark Music Library, Inc. / 560 Lexington Avenue / New York, NY 10022. At the Saugus High School Art Festival, on Saturday, November 22, 2014. At the Barnes and Noble bookstore on route 1 in Saugus, on Wednesday, December 3 at 7:00 PM. At Cliftondale Congregational Church, on Saturday, December 6 at 11:00 AM, as part of the town of Saugus annual Holiday Stroll. Kim Misci, our choreographer, has choreographed Nunsense productions for several different companies. Mary Moffett, our stage manager, has worked on many TCS productions over the years, and with many other producing groups.